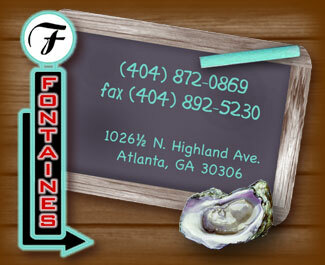 Fontaine's is located on the corner of North Highland and Virginia Avenue. Minutes away from downtown and buckhead in the heart of VA Highlands. The Virginia-Highland area of Atlanta has over 100 privately owned shops including clothing stores, flower shops, gift shops, pe stores and of course restaurants & bars. Parking is a premium, so be sure to take advantage of our free nightly valet at the rear enterance.